Another season, another CAbi party put on my a friend. I never buy anything at these gathering but it's fun to get together with friends, eat food, and look at details. There were several skirts like this in the collection. You could easily use BWOF 10/2008 #103 to make your own. There were a couple of vests in the collection too. I liked the cropped look of this one. I liked this casual seersucker jacket. I found BWOF 08/2006 #119 which is pretty similar. I really liked this jacket. It was topstitched in really chunky sable brown. The back had a cute topstitched tab with button (see drawing). I liked this brown jacket too. It's not really my color but it's cute. It had a lot of zippers, pockets, and other details. It would take forever to make but it would be a great basic piece. The inside is not lined but all the seams are finished with contrasting bias tape. This is your basic wrap dress with a t-shirt and skinny belt. I really liked the dress when she ditched the t-shirt and put the big chunky belt on it (as you can see from my notes). This is the big belt I liked. I really liked this trenchy-jackety top. I don't really like this color. It's horrid on my with my olive-y complexion. This top was really cute too. It's sheer and open in the front. It has ties that keep it closed. I didn't notice until after the presentation that the ties start out skinny (next to the body) but get wider. The end of the ties is about 6" wide with cute little gathered details. The entire garment is finished with a three-thread serger stitch. That's the hem, the ties, the bodice, everything. I knew you guys would appreciate seeing the details on this jacket. It's a bit too fru-fru for me but it's cute and fit well. I liked this lime green tank. It was gathered on the bust and then had a raw edged overlay. IT was a great knit. They had this dress in black too. The black one was shorter. You could totally make this using the BWOF 05/2008 #117 dress. The pattern is for a woven but you could change that. I really liked this cropped sweater. I thought for a couple of minutes about actually purchasing it. But beige is another bad color on me. And, well, I'm cheapfrugal. The flower detail on the shoulder was very cute. The Jalie patterns finally came. I have the jeans traced out but haven't had time to cut them with Easter and all. I hope to cut them out tomorrow but we'll see. I made cute (but poorly made) little Easter Bunny stuffies for my kids. I'll take pictures tomorrow. One of the best things about sewing is you can have anything you can imagine. I love to knock of garments, but make them in my color choices, alter them to fit my body and personality. Looks like you have a lot to choose from. Lots of cute stuff to pick from! I'm at that place, too, where it's a fun challenge to see if you can make it just at well, or better! Good luck, and Happy Easter! Ooh, love Cabi...but don't actually want to pay the prices...thanks for sharing your faves....I can see a few that I like myself!! Pretty selection of models, thanks for the similarity with patterns BWO, it´s good idea! Dawn, check out BWOF 02-2009-115 for a similar jacket also. It may not be as fitted as the ones shown, but still along the lines (I think). I read your following post also and love your jeans. I am going to place an order for this pattern. If you love CAbi, but won't pay the prices, host a show. That's what I do. I get a new wardrobe every season -- about 20 pieces -- at a 60-65% savings. All for having a party with my girlfriends. I'm always the first on my consultants list to sign up. 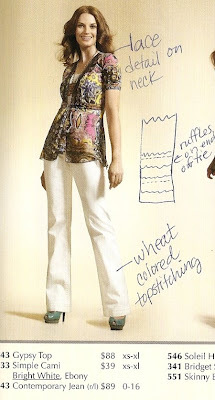 I love to sew, too, but I can't touch the detail work on some of the CAbi, or their fabrics -- not at over 50% off.